Swing Guitars of Korea, is a very serious new contender in the guitar world! 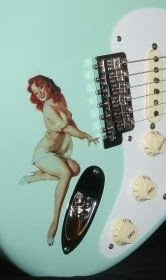 I discovered Swing at the website of Swedish Swing dealer and custom builder, Sliepner Guitars. Originally I thought they were Sliepner's instruments. Our featured model, the BSZ, has a basswood body with a spalted maple top. This series includes a couple other wood combinations you don't often see. Is there any other production line guitar brand with spalted maple tops right now?? Swing has a huge line of guitars and basses, including plenty of Strat & Tele types, but these aren't merely cheap clones folks. They go all out with top materials and hardware, i.e. titanium saddles and GraphTech Nu-Bone nuts. Swing also has a custom shop with their own artist series instruments. The easy to navigate Swing website is loaded with complete product details, great photos and sample audio clips. These guys are NEW-- but watch out folks!!! Guitar World's August issue, with the Jack White cover, profiles Swing's Prism model.